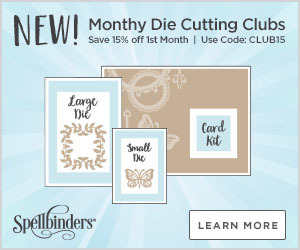 I needed to stick with Stampendous products so that was a challenge too! The ornaments around it’s neck are from a Christmas tree set (looks like it’s discontinued). I colored the ornaments with Copics and drew the snowflakes on with a white gel pen. So here’s the details…the gals have been posting since November 25th and continuing through December 8th. 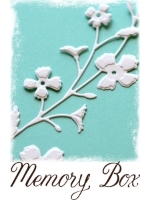 Back to the card… I heat embossed the sentiment, snowflakes and snow it’s standing on with white embossing powder. I inked the sky with Distress Oxide inks, Blueprint Sketch and Chipped Sapphire and the ink blending tool. Did the water droplet thing and glued on some sequins. It’s an A2 size card. Having fun checking out the entries for the ugly sweater contest! Love this adorable penguin! 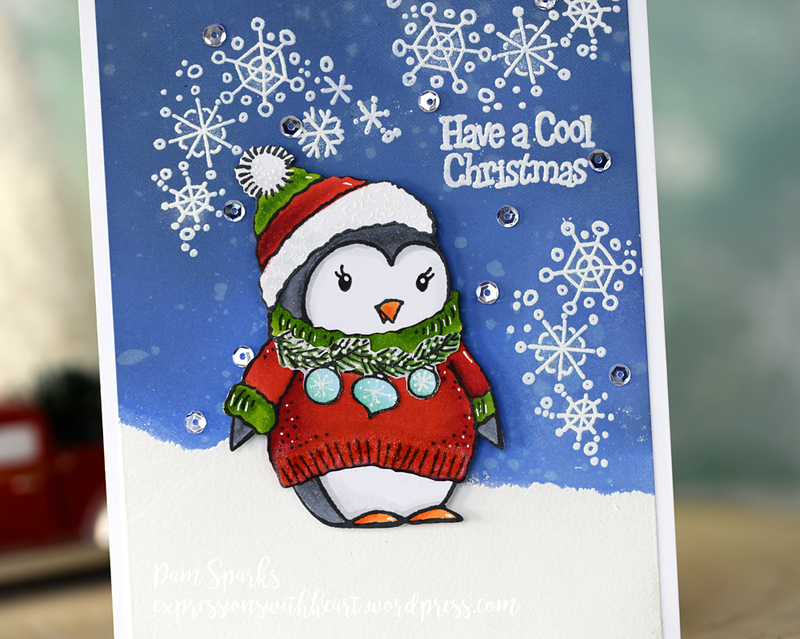 Such an cute scene you created with this darling penguin, nice coloring too Pam! Sorry, Pam, but he is way too adorable for the ugly sweater contest! I’d pick him as winner any day! Love, love him! I think your penguin is cute my mind thinks like yours about the babbles around your neck good luck with the contest. Sorry, no ugly sweater here….just one cool little penguin with a cool sweater…Good job on the snow also..really pops. I may have to have this Penguin. Oh, hahahahahaha! 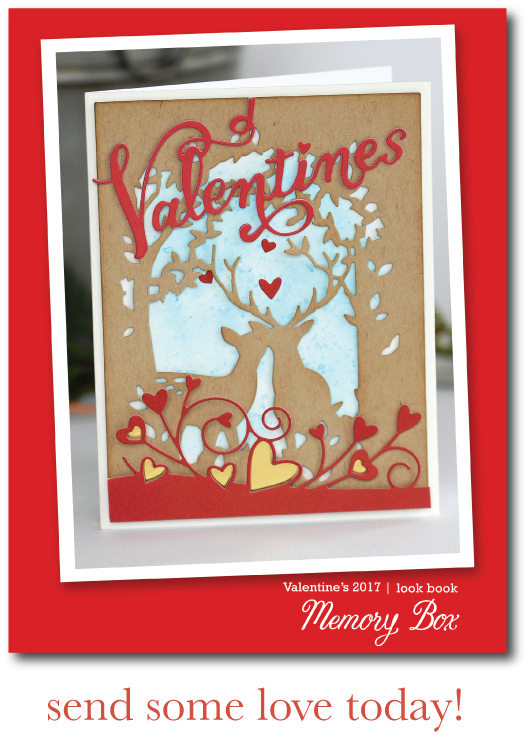 I love Stampendous and I love your card! What a fun challenge! He’s so cute with his wreath and ornament necklace. I’ll have to go check out the site. 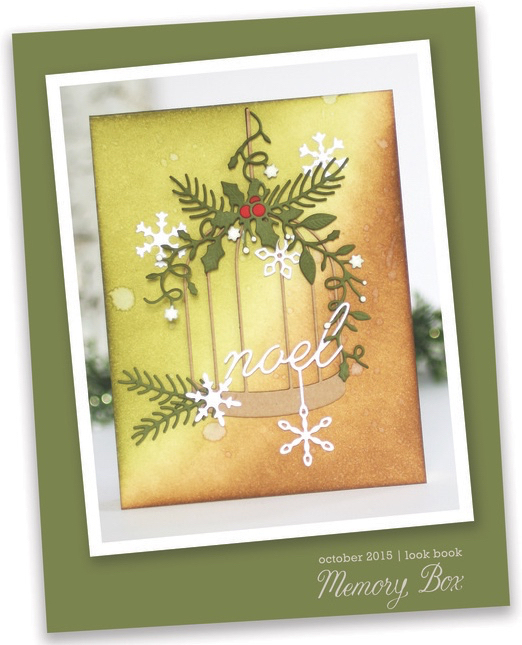 Stampendous is on my after Christmas shopping list! Such a cute “ugly sweater”. Pingback: Sweater Wrap Up! Time to Vote! Its so hard to call this an ugly sweater! Its such a cute card! Hi Pam, You know what, I clicked on the link that said Karen and it brought me to you, not sure what will happen when I click on your link which is next in line, not sure if that happened to everyone?? 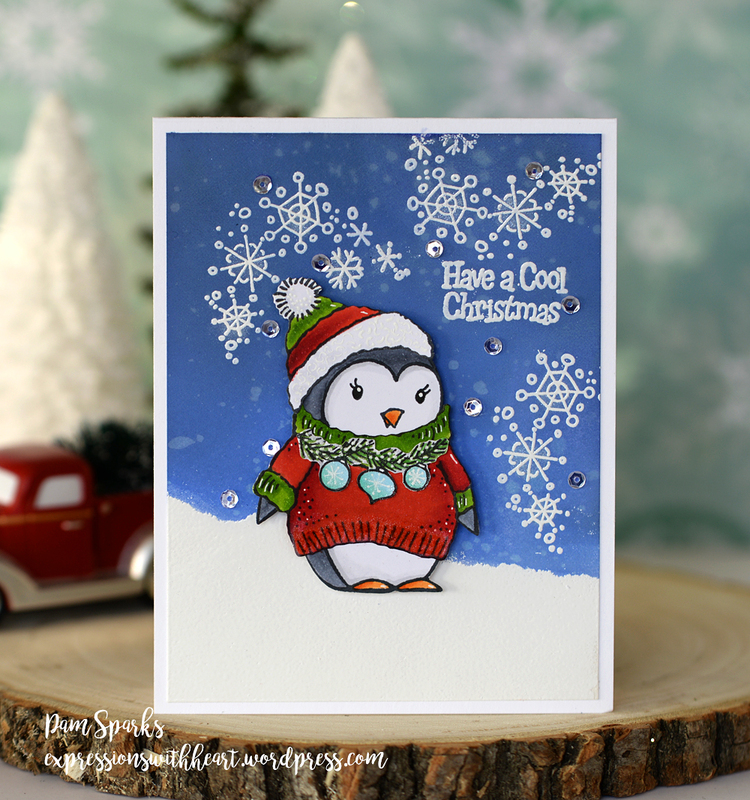 Just hope they know this is PAM’S site not KAREN,, Anyways, I LOVED your card, just way too ADORABLE, my mom would love that, she is up in the snow and collects Penguins, You did an amazing job, Good Luck with the contest sweetie !!!!! so cute with the ornaments around the neck and the snowy background. Oh this is so cute Pam! I love penguins! Such a cutie! 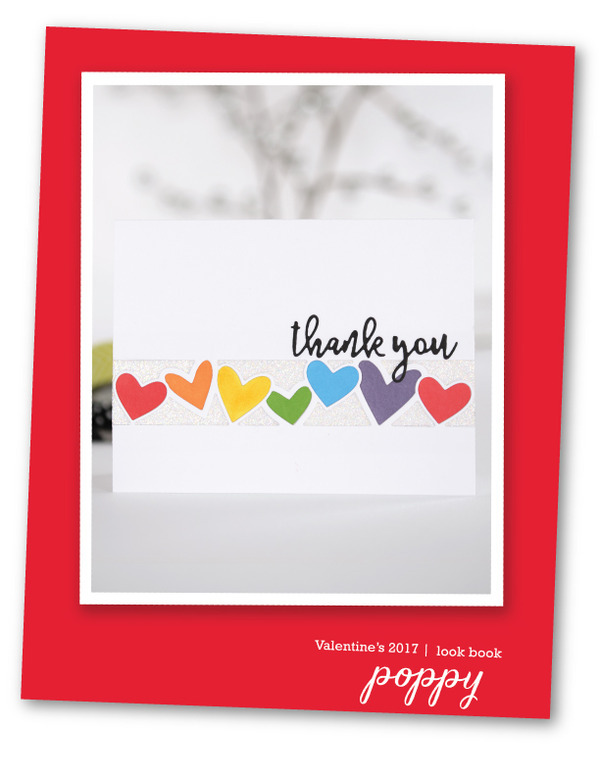 Sorry, dear friend, but there is nothing ugly about this darling card! Love it!!! As always, you blow me away with your creativity! Another card so beautifully done and so adorable. I’m going through your blog and checking out what I’ve missed and I’m so glad I stopped by to see this one. Beautifully done!